Australian Fairy Tale Society members are cordially invited to nominate individuals for the AFTS annual award. Nominations will be accepted until 5pm EST Monday 30 April 2018. Only two weeks remain to enter our AFTS short story competition! 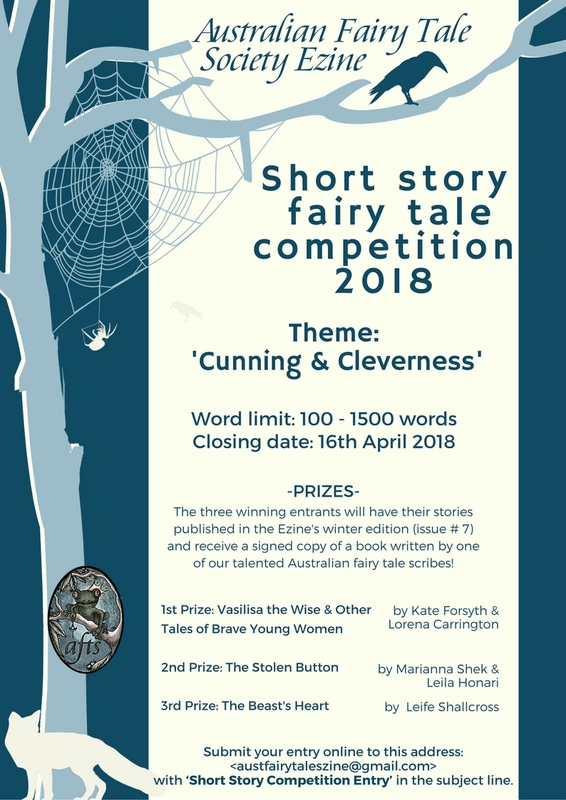 Submissions close on 17 April, 2018 for short fiction on the theme of ‘Cunning & Cleverness’. Maybe you’re deliberating about the merits of entering a writing comp? Our AFTS ezine #6 article ‘Writing Competitions: Are They Worth It?’ by author Georgina Ballantine is here to help. Or maybe you write for children and you’d like a little advice and motivation from author Pat Simmons: check out her ezine #6 article ‘Writing Stories for Children’. Need some motivation to put fingers to keyboard? We have prizes galore! 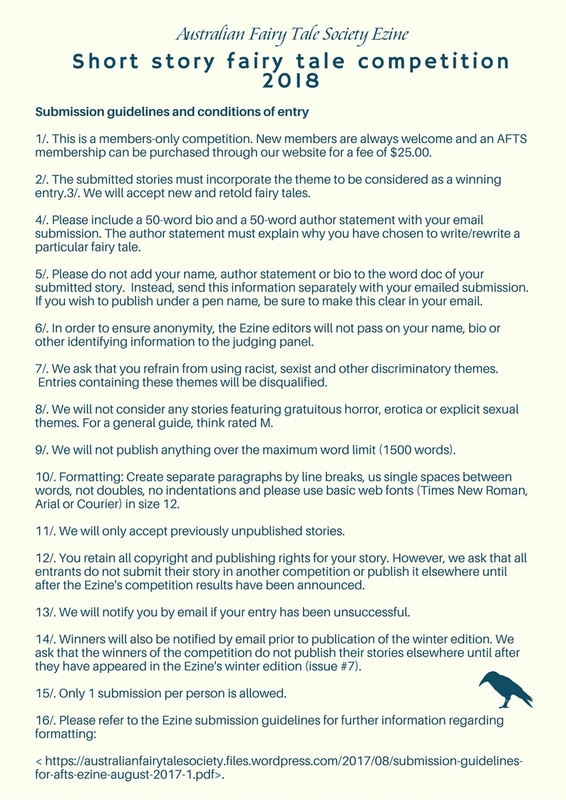 All three winners will be published in the AFTS ezine #7 (winter edition). Signed copies of books by celebrated Australian authors and illustrator are also up for grabs. Whet your fairy tale appetite with our #6 ezine excerpts from fairy tale retellings in Vasilisa the Wise and Other Tales of Brave Young Women by Kate Forsyth and illustrator Lorena Carrington (1st prize), original fairy tale The Stolen Button by Marianna Shek and illustrator Leila Honari (2nd prize), and upcoming novel The Beast’s Heart by Leife Shallcross (3rd prize). The ezine #6 also includes book reviews of all three titles. Our illustrious judges are celebrated authors Sophie Masson, Monique Mulligan and Nike Sulway. Although the comp is members-only, don’t let that put you off if you’re not a subscriber. For the AU$25 annual membership fee you’ll receive copies of our fabulous ezine, access to our enlightening Fairy Tale Ring meetings, discounted entry to our AFTS conference on 10 June, 2018, and the opportunity to submit work for publication in our ezines. scheming selkies and brainiac boggarts, or whatever floats your fairy tale boat!